Adults and children compete just like a real sumo wrestler in these oversized sumo suits. For indoor or outdoor use, after prom, birthday parties, corporate events and more. 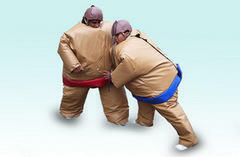 These crazy fun sumo suits are designed for pre-teens, teens and adults 48" or taller. Opponents climb into their suit, enter the ring and try to push, pull and shove their way to victory. This rental includes two sumo suits, sumo mat, protective headgear, delivery, instructions, and take down.